Did The NDA Government Really Quadruple Forex Reserves? While the circumstances are dramatically different and external factors obviously had a role to play in many of these numbers looking good or better subsequently, we decided to do a pure data dive to see what else emerged from this period on these parameters. Let’s begin with a definition. Current account deficit/surplus is defined by economist Ajay Shah as three things: the gap between revenues from selling goods and services and the payment made for buying goods and services. This has to be matched by the capital inflows into the country. This is exactly the gap between investment and savings. 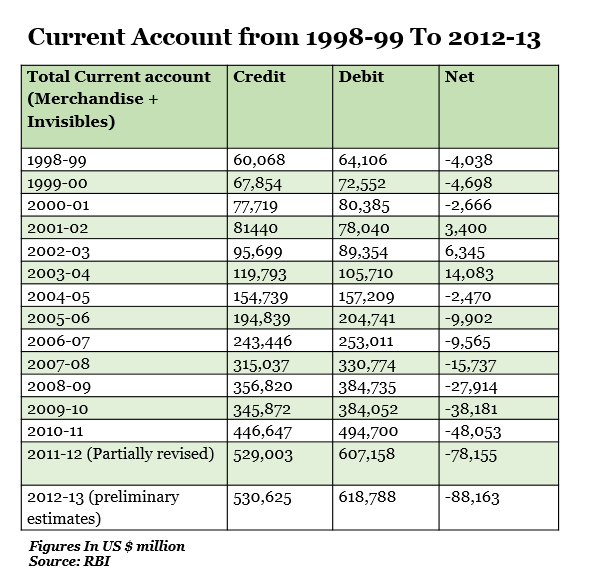 If we look at data from Reserve Bank of India, it seems there was current account surplus during the years 2001-2004. 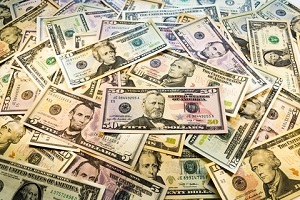 In 2001-02, there was a surplus of $3.4 billion; the following year saw a surplus of $6.3 billion and there was surplus of $14 billion during 2003-04. 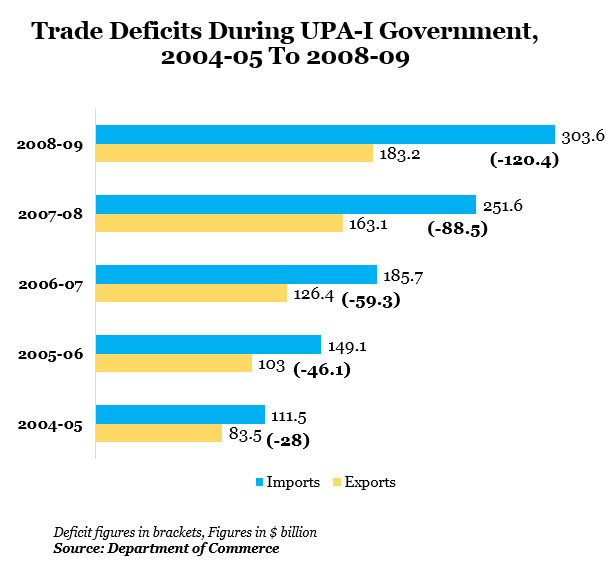 And none of the years of the UPA tenure (since 2004) have seen a current account surplus. If we look at import/export for the time period, we can see that imports doubled from 2003 to 2004. Imports increased from $78.1 billion in 2003-2004 to $111.5 billion in 2004-2005. The deficit has been growing steadily even as the current account deficit has grown steadily. 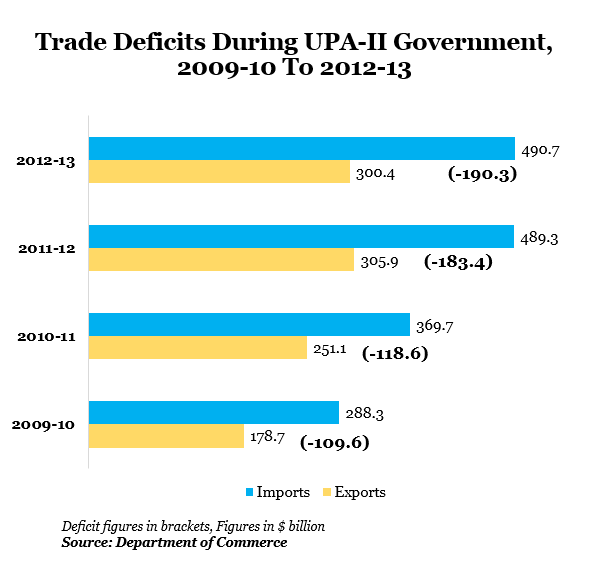 In 2004-05, the import/export deficit stood at $28 billion, which zoomed to $190.3 billion in 2012-13. 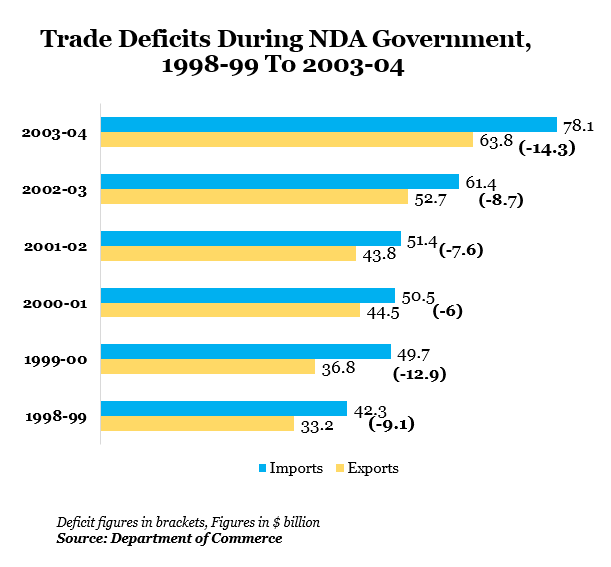 On the other hand, the deficit was maintained during the NDA years – 1998-99 ($9.1 billion) to 2003-04 ($14.3 billion). 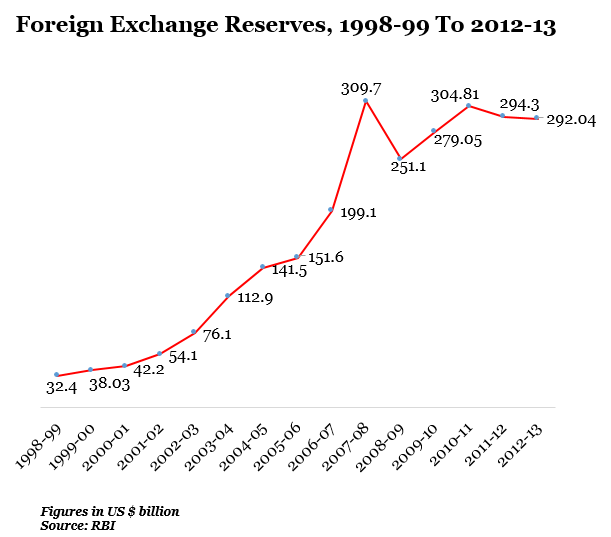 Foreign exchange reserves increased from $32.4 billion in 1998-99 to $113 billion in 2003-04. So, it is true that India’s foreign exchange reserves quadrupled during the tenure of the NDA Government. But do note that foreign exchange reserves also hit their highest mark in the year 2007-08 – so they tripled since then on a higher base! So, it is true that for 3 years during the NDA Government’s tenure, there was a current account surplus between the years 2001-2004. And we can also see that the claim about foreign exchange reserves quadrupling over the tenure of the NDA Government is also true. You are right, there were a lot of external factors which were responsible for the changes we saw in the Current Account during that period and later. We’ve referred to it but not analysed it because the purpose of this article was a straight Fact Check on a statement made by the BJP National Treasurer Piyush Goyal. Thank you for your feedback.